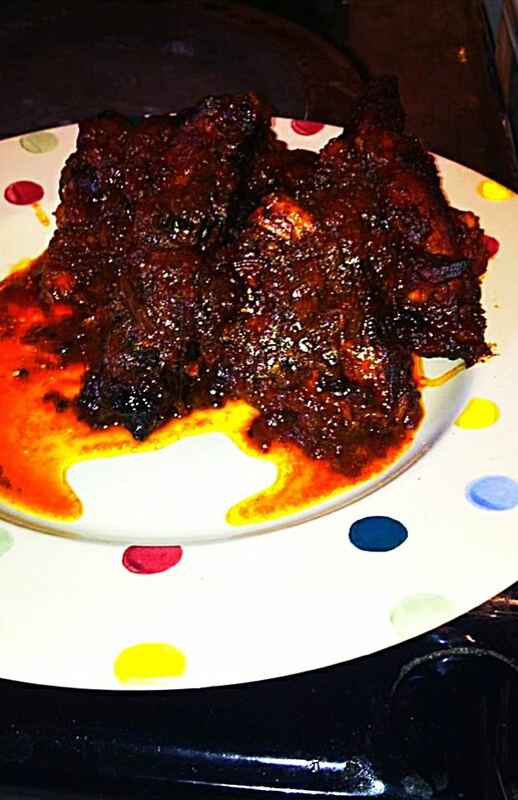 Living in a houseful of males its inevitable that i'd need a decent rib recipe. To be fair it's not so much a recipe as just sort of throwing everything in a big bowl giving it a bit of stir, a little time to rest, then chucking them in a hot oven. If you want a less burnished rib start off hot (about an hour and a half at 200) then cover and turn down (110) the oven or whack in the bottom if you're an AGA lover and leave for 3-4 hours. Put all of the above ingredients except for the ribs into a large mixing bowl and give a good mix, then add the ribs massage into the meat and leave to sit for about 2 hours room temp (or in the fridge while you're at work). Spoon into a very large baking tray in a single layer, then drizzle over a little more honey about 2 tbsp, put into a hot oven about 220 for 20 minutes then turn down to 200 and bake for about 90-120 minutes, turning in the sauce every 20 minutes or so. Or for soft falling off the bone after an hour cover and turn the oven down to 110 and cook for about 3-4 hours. Once you take them out of the oven put onto a warm serving plate and add a glass of water to the baking tray and heat on the top, finish with a knob of butter for a shiny sauce. We have ours with jacket potatoes and a rocket salad.